Evergreen shrub attaining 1-4.5m in height; young shoots hirsute with simple, smooth hairs. Leaves in whorls of 4 (sometimes in 3s), linear to 7-0.5mm, light to dark green. Inflorescences usually numerous and crowded towards ends of shoots, appearing to form elongated panicles: 1-4 flowers in each terminal umbel at tip of short, leafy lateral shoots. Corolla white, often tinged pink in bud, narrow-campanulate to tubular-obconical, c. 5mm long. Stamens 8; filaments white, with microscopic hairs at base extending about a third the way up on sides and surfaces. Flowering in winter and spring (sometime from late autumn). Often confused with Erica arborea (tree heath), this species can be distinguished clearly by two characters, both easily detectable using a good hand-lens: there are no branched hairs on the stems, but there are hairs, tiny, simple ones, on the lower portions of filaments of the stamens. 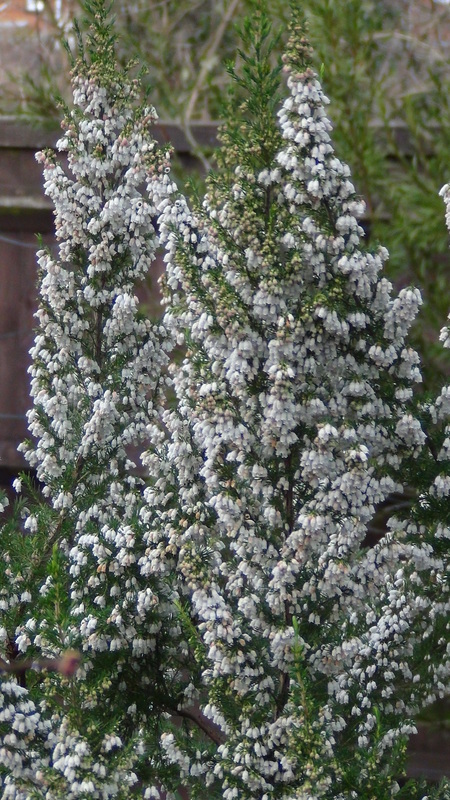 Erica lusitanica is native on the Iberian Peninsula ranging into south-western France. The Flower: White flowers, often tinged pink in the bud. Flowering Period: December to May.